Twenty one authors take a stand in their personal blogs, social media platforms. 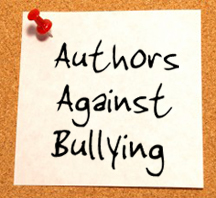 International digital-first publisher Samhain Publishing® today announced that several of its authors will be participating in the Authors Against Bullying event, an initiative first created by authors Mandy Roth and Yasmine Galenorn. The event, designed to allow authors to share their experiences and stories with bullying, is intended to create an open dialog between authors and readers during the month of October, designated Bullying Prevention Awareness Month by PACER's National Center for Bullying Prevention. Examples of these blogs include Mandy Roth (http://mandyroth.com/blog/2012/10/19/authors-against-bullying/) and Aaron Dries (http://www.aarondries.com/apps/blog/). To show support or to contribute to this event, interested readers can spread the word, comment on the blogs, or share their own stories in a supportive and inclusive environment. Launched in 2005 with a vision of bringing extraordinary fiction to compulsive readers (who sometimes can’t wait for a book to actually be printed), Samhain Publishing® is an international publisher of ebook and traditional print fiction. One of the most prominent voices of original ebook fiction, Samhain represents some of today’s brightest authors of romance and horror fiction. To learn why at Samhain “it’s all about the story…”, visit Samhain Publishing online at http://www.samhainpublishing.com.